“‘Cybergeneration’ is a song and movie dedicated to the young future and the Spirit of Woodstock Festival in Mirapuri. 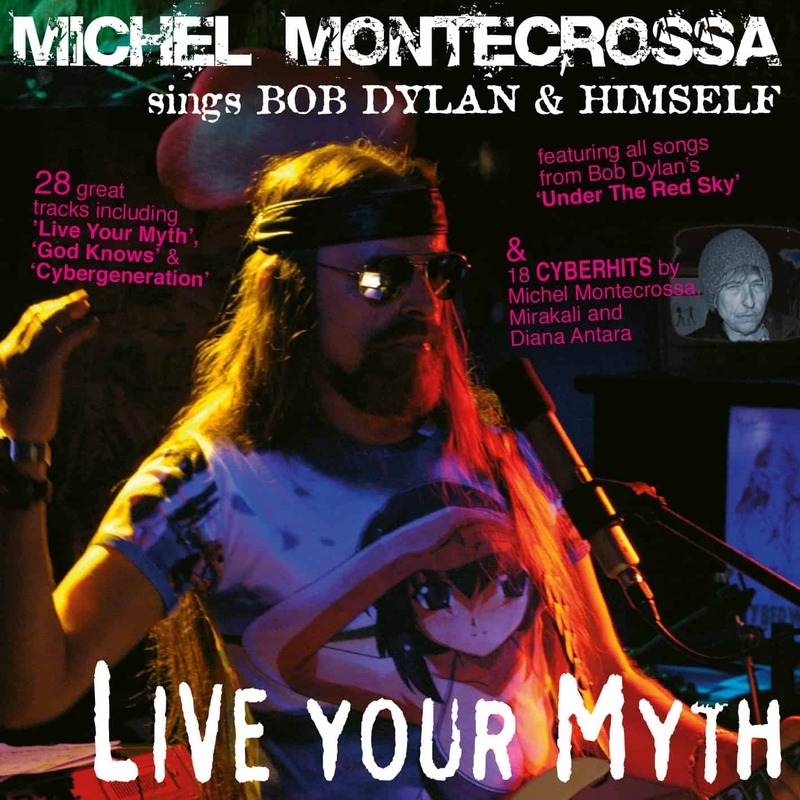 Continuing the Sounds on Thursday blog post series with the Dance-Electronica Song & movie ‘Cybergeneration’ by Michel Montecrossa. “‘Cybergeneration’ is a song and movie dedicated to the young Facebook-Twitter-Microblogger based revolutions that toppled not only the Egyptian regime but brought a new and dynamic vision of change to the whole world. The young neither want to live in a suppressive Old-Cairo-World, nor do they want to live in a Radioactive-Fukushima-World. They rather like to live in a Freedom World of renewable energy, peace, fair wages and work for all. Cybergeneration! Consciousness Expansion! / Cybergeneration! Consciousness Extension! / Cybergeneration! Conscious And So Handy! / Cybergeneration! Conscious Understanding! Cybergeneration! Conscious And So Handy! What Do You Want To Know? What Do You Want To Show? Are You Living? Are You Strong? Are You Loving? Are You Born? Cybergeneration! Conscious To Be Young! Cybergeneration! For Love There Is No Ending! Cybergeneration! Ridin’ On The Rays Of Light! What Do You Want To Do? What Do You Want To Prove? Are You Really Seein’? Do You Have The Feelin’? Are You The Freedombeing? Are You Truly Livin’? Cybergeneration! Conscious, Warm And Friendly! Cybergeneration! Conscious, Kind And Sunny! Michel Montecrossa will play each day of the Spirit of Woodstock Festival 2014 – from 25th July to 3rd August 2014 – two Live-Concerts! Michel Montecrossa and his band The Chosen Few are presenting as special DVD and download 11 music movies from the Michel & Bob Dylan Fest 2013 ‘Tempest Of Darkness & Light’. Released by Mira Sound Germany and Filmaur Multimedia the special DVD and download is a ‘anything goes’ masterpiece of Full-Stream-Of-Consciousness movie making created by Michel Montecrossa, Diana Antara and Mirakali as a groundbreaking and cool Topical Art and Cinéma Vérité landmark production for Cybergeneration. 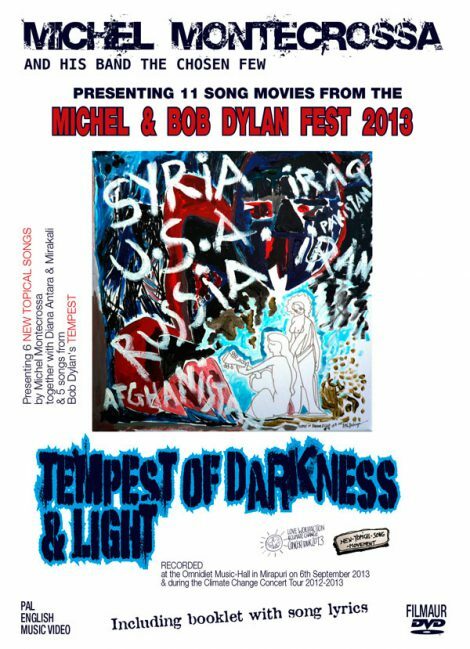 The 11 music movies from Michel Montecrossa’s Michel & Bob Dylan Fest 2013 ‘Tempest Of Darkness & Light’ have as opening song Michel Montecrossa’s ‘Malala’s Tempest Of Darkness & Light’ showing pure Topical Cinéma Vérité confronting insane brutality with the victorious Light of Soul and Humanity. Bob Dylan’s ‘Tempest’ comes next and is located in a crossover space between dreamworld and waking state creating a surreal interaction between history and a fluid state of reality building. ‘Calm Beauty’ is Michel Montecrossa’s grand mystic song from his movie ‘The House Of Time, Part Two’ lifting the veil between life and death. It leads to the precarious ‘Duquesne Whistle’ of Bob Dylan and from there to the unvarnished truth movie ‘Burnin’ Heart’ showing love action the warrior way. Bob Dylan’s ‘Soon After Midnight’ shows the other side of confusing love with error. ‘Strong Love, Strong Life’ is Mirakali’s superb song movie presenting what it means not to be an idiot claiming to know anything about love. ‘Narrow Way’ is Bob Dylan’s dirge in nowhere land and ‘Talking World War & The Nato Gang’ is Michel Montecrossa’s uncompromising intrusion on the war business lies of polito corruptos and banka gangstas who want to kill Syria, the Middle East and soon the entire world. Apocalypse goes on with Bob Dylan’s ‘Tin Angel’ and a sick lust and madness relation soap. Its Endzeit comes to an end with Michel Montecrossa’s sovereign ‘Strong Is My Christmas Dream’ leading out of the fog and dirt of a distorted mind clinging to suffering and half knowledge into the full brilliance of living Love and Oneness. 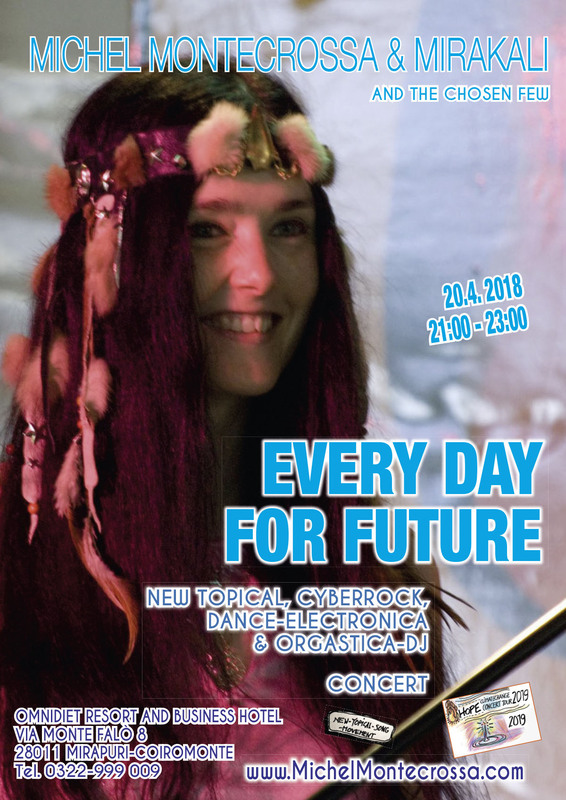 ‘Cybergeneration‘ Michel Montecrossa’s new-topical-song-movement Audio Single and DVD released by Mira Sound Germany is dedicated to the young pro-reform and democracy movement reaching from Fukushima to Cairo and around the world.